Fall is one of my favorite times of year – the weather starts to cool down, the leaves start to change colors and then begin gently falling. Thanksgiving is then just around the corner. Wouldn’t this box look great at everyone’s plate when you sit down for the best holiday dinner ever? You may not have room for a full dessert, but you always have room for two little chocolates! Especially when they are Ghiradelli caramels. 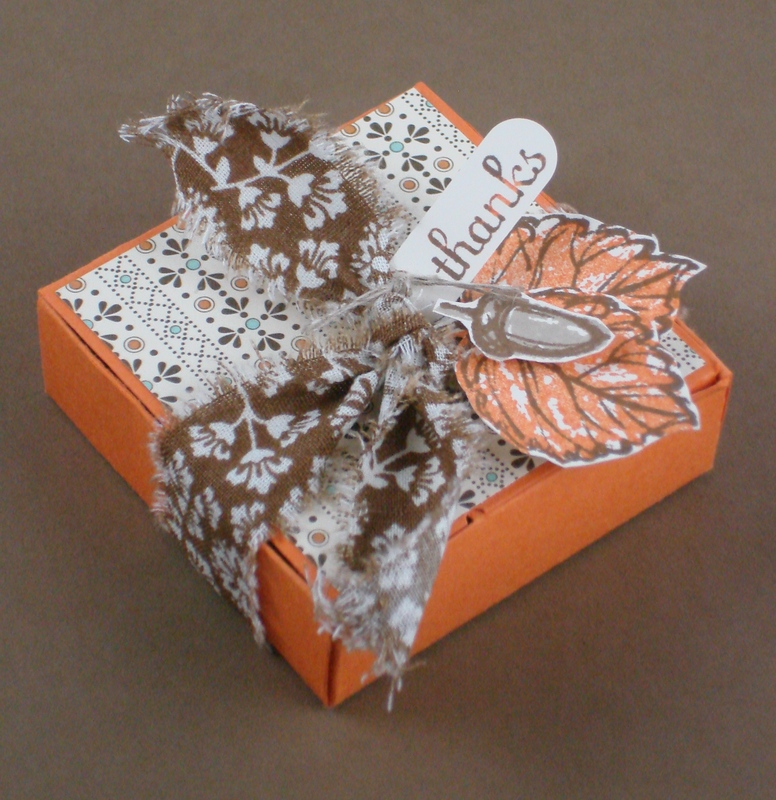 They fit perfectly inside this box which is made with the Bitty Box w/Envelope Bigz XL Die. It’s a charming little box with leaves from the new Gently Falling stamp set decorating it. I also used the new Spice Cake Fabric as ribbon by tearing strips of fabric and fraying it around the edges and then adhered Spice Cake DSP on the top and bottom of the box. This box is very easy to put together and requires only a small amount of adhesive. Falling Gently is full of different size leaves plus a little acorn. This set is a two step stamp set meaning you stamp a solid stamp image and then an overlay of an outline stamp in a different color to highlight and define the original stamped image. I used Pumpkin Pie Ink with an overlay of Soft Suede Ink on my leaves. It’s so fun and easy to use a stamp set like this. In addition to the two leaves stamped for the top of the box I then stamped two extra images and placed them on top of each of my chocolates for an extra flair when you open your box of chocolates. Finished it off with a small acorn and a tag of thanks from the Fabulous Phrases stamp set. Would you like to learn how to make these cute little favors for your next Thanksgiving gathering? When you host your own party, you earn a FREE 2011-2012 Idea Book & Catalog and based on the sales at your party you can earn product to make your own favors for FREE. Want to learn more, just give me a call at 410-673-1673 or e-mail me at sweadon@hotmail.com and I can set up a party for you and your friends to have a girl’s night out and stamping too! Supplies: Stamp Sets: Gently Falling and Fabulous Phrases, Card Stock: Pumpkin Pie and Very Vanilla; Ink: Soft Suede, Pumpkin Pie, and Crumbcake; Designer Series Paper and Designer Fabric: Spice Cake; Accessories: Word Window Punch, 1-1/16″ Circle Punch, Linen Thread, Dimensionals, Big Shot, Extended Cutting Pads, Bigz XL Bitty Box & Envelope Die. What a cool Thanksgiving favor! I love it! What a cute box! Love that fabric. I love how the crisp patterned paper contrasts with the soft fuzzy edges of the fabric. Great project. Great thanksgiving treat box! Very creative. Thank you for playing along with Pals Paper Arts.